So now I have read all three Gillian Flynn novels, and I also saw the movie Gone Girl last week (which was my first book, too.) I read them in reverse order, which I don't recommend. 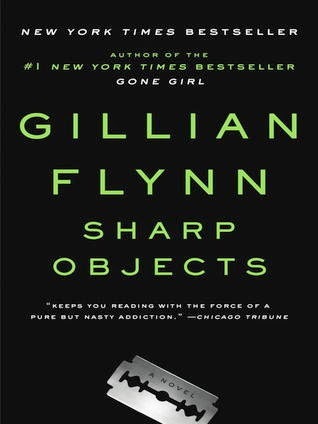 Like most authors, Gillian Flynn's writing skills have developed with each book, so when you go back, they don't improve. I think I would have liked this book much more had I read it first. Camille has to return from Chicago to her hometown in rural Missouri to investigate a story about missing girls, as her boss is determined to be ahead of the next big serial killer story. But her hometown is not at all a happy place for Camille. And due to a small budget, she must stay with her mother, step-father, and thirteen-year-old half-sister in their impeccable Victorian mansion. Bad things happened in this town in the past, and those resurface for Camille, dredging up memories that caused her old cutting problems. Meanwhile, will she figure out what's been happening to these girls and help the cute out-of-town cop solve the mystery? I found the book okay but uneven. Camille's sister has that common problem of in some scenes sounding eight, and in others sounding twenty-five. I hate that inconsistency. I know partly that's because she's supposed to be somewhat regressive to a younger age in some scenes, but it didn't sit well with me. She was a hard character to pin down. Camille's step-father might as well have not been there, which I know was his personality, but I don't like a useless character. And I really don't think Camille's habit of cutting words--instead of just lines--is a thing. That felt contrived. the point of view of the mystery than I had initially thought (good red herrings.) And the ending did throw me for a loop. It was completely surprising, but it was well set up once you thought back. Ms. Flynn's characters and plotting have improved, but you could see her talent even with this first novel. I bought this book at Barnes & Noble.